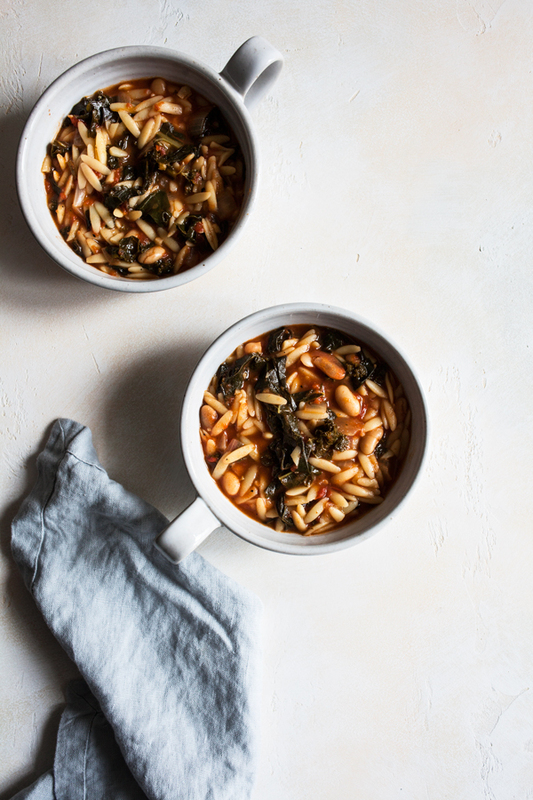 Easy comfort food is the name of the game this week: rice n’ beans on Tuesday, and this simple, warming, and filling tomato orzo soup with kale today. Over the summer I made an orzo and chickpea dish with roasted tomato sauce, which I loved. The only downside of that meal is the time involved: the roasted tomato sauce is relatively hands off, but it’s homemade from fresh tomatoes, so there’s a bit of a wait. 2-3 hours of a wait, to be exact. Great for a slow weekend, not so great for a busy weeknight or a hectic season. 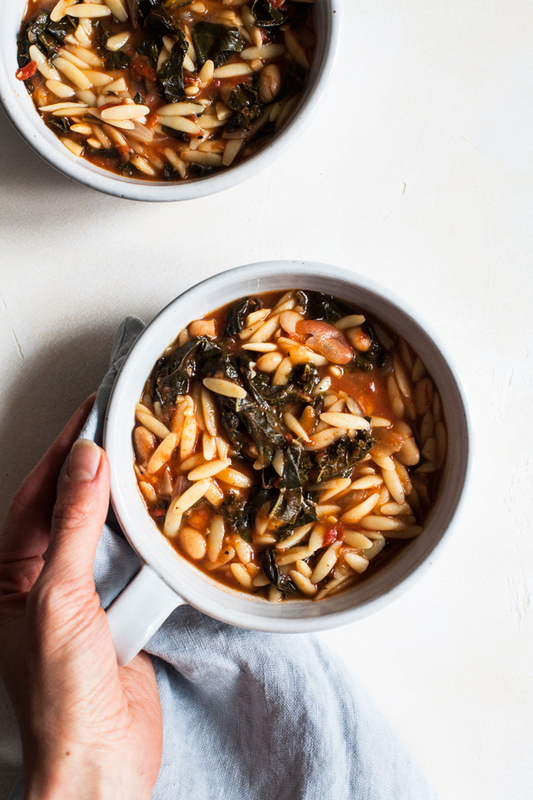 This dish is similar: a mix of orzo, beans, and tomato. 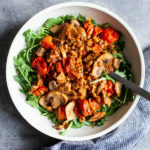 But it’s more of a soup than a pasta dish, and—thanks to the use of chopped tomatoes from Pomi—it comes together a lot more quickly. The orzo will be ready after about 15 minutes of simmering, and all that remains after is to cook down the kale. It’s a true comfort food meal that be ready in about half an hour. The tomatoes are organic, low in sodium, and they come in BPA-free, recyclable cardboard packaging. They’re available in chopped and strained varieties (the strained tomatoes are similar to tomato sauce), and I’ve loved working with them so far. They taste fresher and less acidic than some other brands, and the lack of added sodium means that you can take charge of seasoning in the recipe. This is a thick soup, similar to stew, but you can control the texture by adding more water at the end of cooking. 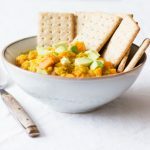 I threw in cannellini beans for protein and additional texture, but you can use chickpeas, lentils, or navy beans instead. I definitely recommend adding some vegan parmesan, my hempesan, or nutritional yeast to the pot for a touch of cheesy flavor, or sprinkling some on your bowl before you eat. 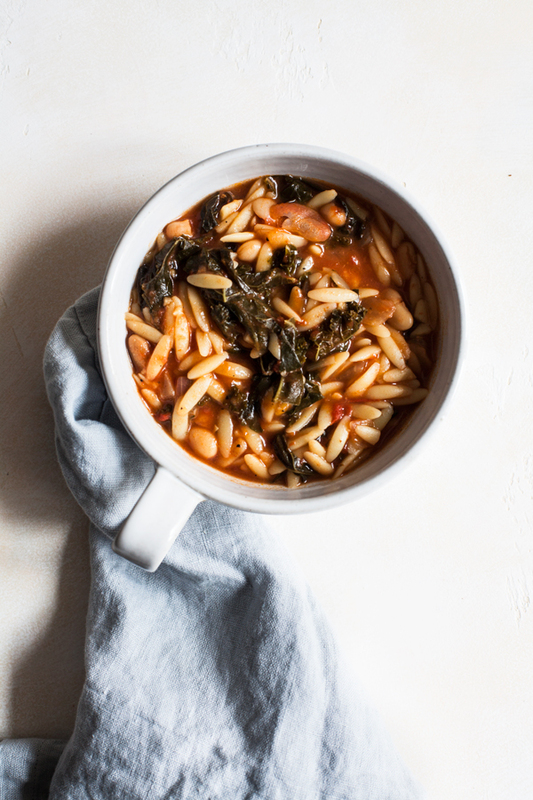 Either way, this is a homey, filling, and wonderful one-pot meal for wintery weather. You can find the easy recipe over at the Pomi website. Hope you enjoy it, and I’ll see you soon for weekend reading! This post is sponsored by Pomi. All opinions are my own, and I love the quality and freshness of these tomatoes. Thanks for your support! This looks delicious! FYI, the Pomi website seems to have the ingredients listed, but the directions note there are lentils and tofu. This is in their web instructions and also the downloadable recipe. Thank you for the kind words about the recipe, Denise, but so sorry about the glitch! I’ve let Pomi know and they’ll fix it ASAP. In the meantime, editing my post to include instructions. I appreciate the head’s up! Thanks for the recipe. I will try all of these dishes in this weekend by cooking myself. Hi Gena. Love your emails and recipes – thank you, thank you! 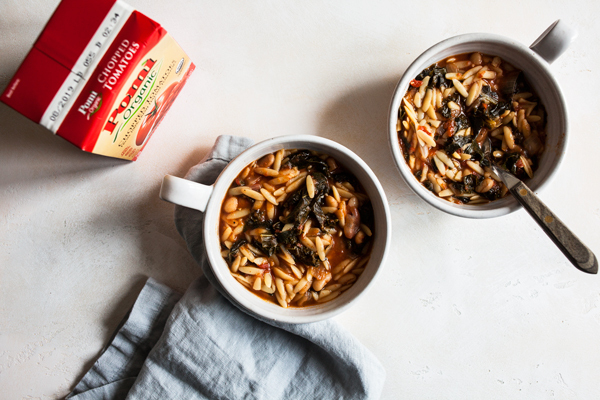 FYI the link to the recipe appears to be broken – you can now access the recipe here: https://www.pomi.us.com/en-us/recipes/recipes/tomato-orzo-soup-kale/ Cheers, Amelia.